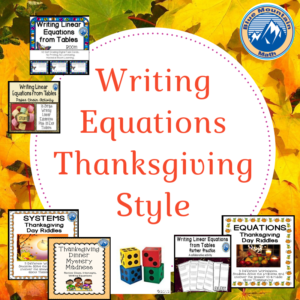 Students have problems writing equations. It seems to be because there are so many ways to do it. If they could have just one way of writing an equation, they could be successful. I embrace a variety of ways to solve problems, but this confuses my students. They like things simple. 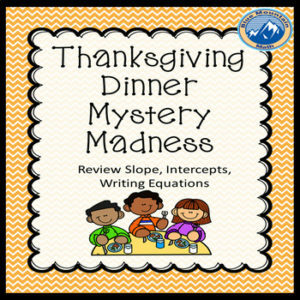 They can write an equation in slope-intercept form. But only if given the slope and the y-intercept. Well, some of them can. A few students are mixing up the two things. We have reviewed and practiced. We did some dice rolls as well. They need more practice and we will give dice activities another try on Tuesday. Next, I presented a graph, they were still successful. Then I threw in slope and a point. Some were still successful, able to use both point-slope form and slope-intercept form. But there were a lot of arithmetic problems, and if they were given a fraction as slope they were scared. If you are looking for other activities where you can use your dice, check these out. While out Friday night with a group of teachers, the subject of dice activities was mentioned. My retired friend Jeanne reminded me of a dice activity she did in her class which was very successful. Students were in groups. They were completing a worksheet and different groups presented the solution For some problems, students explained the steps at the board. How did they choose the student in the group? They rolled the dice! Students were numbered 1-5 in each group and if they rolled their number, they had to explain. This ensures that everyone understands the problem because the presenter is random. What if they rolled a 6? This gave the group the option of choosing who would present. This is one way of having group accountability. Friday (yes, the day before a three-day weekend) I was wise enough to know they would be squirrelly so we played the quiet game for the first half of the period. It worked incredibly well. I simply put a variety of review questions in a powerpoint. My students were placed in rows. I gave each row a whiteboard and marker. 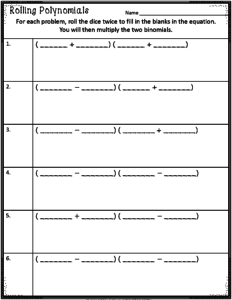 The first person in each row did problem 1, with no help from their team. I called time and checked all the problems. Correct answers received points for each team and the board/marker was passed to the next student. This continued, rotating players until our time was up. We did about 20 questions, a really good review actually. From this I know they still need to review writing equations from graphs. I also know which students are still struggling with the slope. I made notes as they played. Because I took points away if they called out answers, they were quiet and controlled. I gave candy to the winning team –at the end of the period as they were leaving—no one goes on a sugar high during my class ;). I am Thankful that I work in a creative field like teaching. I am also grateful for all my students who embrace my activities with enthusiasm even when they sometimes go wrong (yes, that happens). Without students, I cannot teach. I am especially grateful for my colleagues who offer suggestions and ideas to expand my teaching strategies. I am grateful for readers who email me with suggestions, we are all improving together and it feels good to be part of a community where we uplift each other. Sometimes all we hear are people finding fault with each other, but I remind myself that we are all works in progress. May we all continue to ignore the specks in each other. 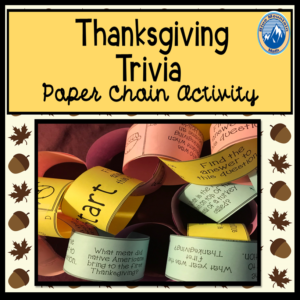 If you have not tried a paper chain activity, try this Thanksgiving trivia. 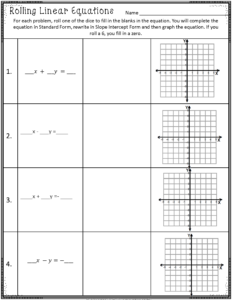 Have some fun with this in class. Or use as a dinner activity. 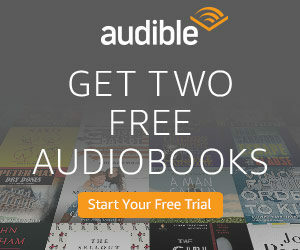 My gift to you this holiday. 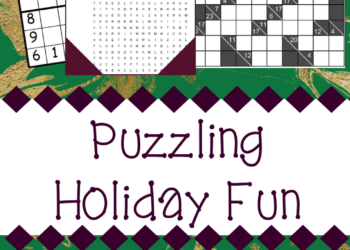 This free resource has several holiday-themed activities for your class. 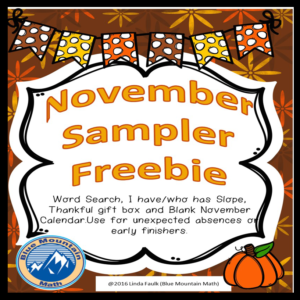 Included is a word search, a calendar and some cute gift boxes to print. 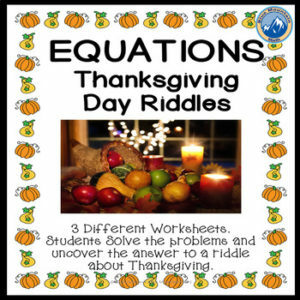 If you need to review equations, here are some Thanksgiving riddles that will entertain as well as provide needed practice. Which celebrities are coming to dinner and what are they bringing? Students will have to solve the mystery to find out. 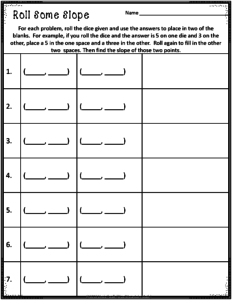 Years ago I spoke at a conference just before Thanksgiving and used this activity to show how you could engage students while encouraging group work and provide rigor. 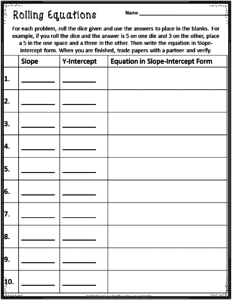 This activity reviews finding the slope, writing equations in both Slope-Intercept form as well as Standard form and finding intercepts. Students suggest I do another one for Christmas. 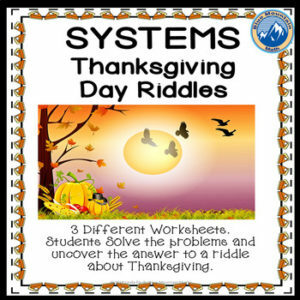 This is another riddle but this solves systems using elimination and multiplying one of the equations. 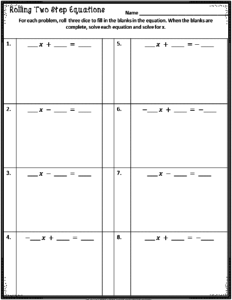 There are three riddles included. 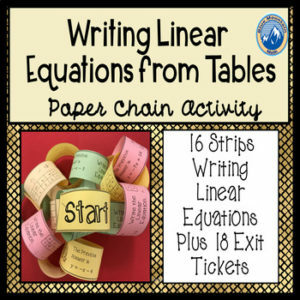 I confess I do not understand the thrill of paper chains. But my students love them, ask for them on a regular basis. Other teachers tell me they are successful in their classrooms as well. My room is alive with color. This is the easiest way of infusing color in your teaching. Just print each of the pages in a different color paper, and cut out the strips. I never let my students cut. One of my teacher friends let his students cut the strips and a 30 minute (at most) activity turned into a 2-day activity. There’s no doubt. 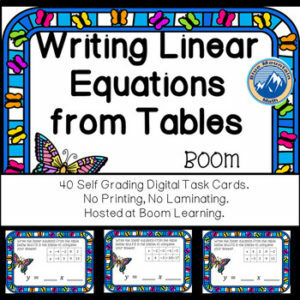 Everyone loves Boom Cards. 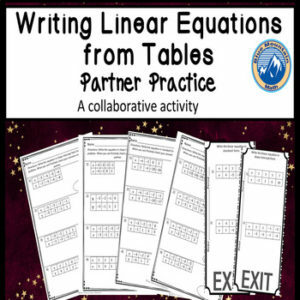 Here is one that I used Thursday to practice writing equations from tables. The sound will tell you which students are having trouble. Teachers only need to focus on the strugglers. My students enjoy partner activities. When they have different problems, they need to show their work. This way they are sure their answers match. Great error analysis.